Red Raspberry (Rubus idaeus) is a perennial crop from the Rose family. Washington is a national leader in production and is responsible for approximately 95% of processed red raspberry production. Aggregate fruits (“berries”) develop on biennial canes that arise from a perennial root system. Canes are vegetative during their first year of growth and are referred to as primocanes. Primocanes develop flower/fruit buds that overwinter and produce a crop the subsequent season. These overwintered flowering/fruiting canes are referred to as floricanes. After harvest, floricanes are removed and the next cycle of primocanes are selected for production. Some types of raspberries produce a crop on primocanes and are referred to as fall-bearing or primocane-fruiting raspberries. The majority of production in Washington state and within the Pacific Northwest is from summer-bearing or floricane-fruiting raspberries. This comprehensive publication provides a review on establishment, maintenance, soil and fertility, pest and disease management, and harvest/postharvest considerations. Production guideline for the unique conditions of the Inland Northwest and Intermountain West. Topics include site preparation, maintenance, and pest and disease control. 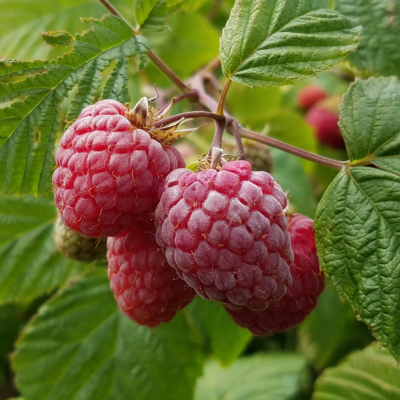 Review of red, black, yellow, and purple cultivars of raspberry. Overview of new EPA regulations on fumigation, fumigation techniques, and alternatives to broadcast fumigation. Review of nutrient management, as well as soil and foliar testing.